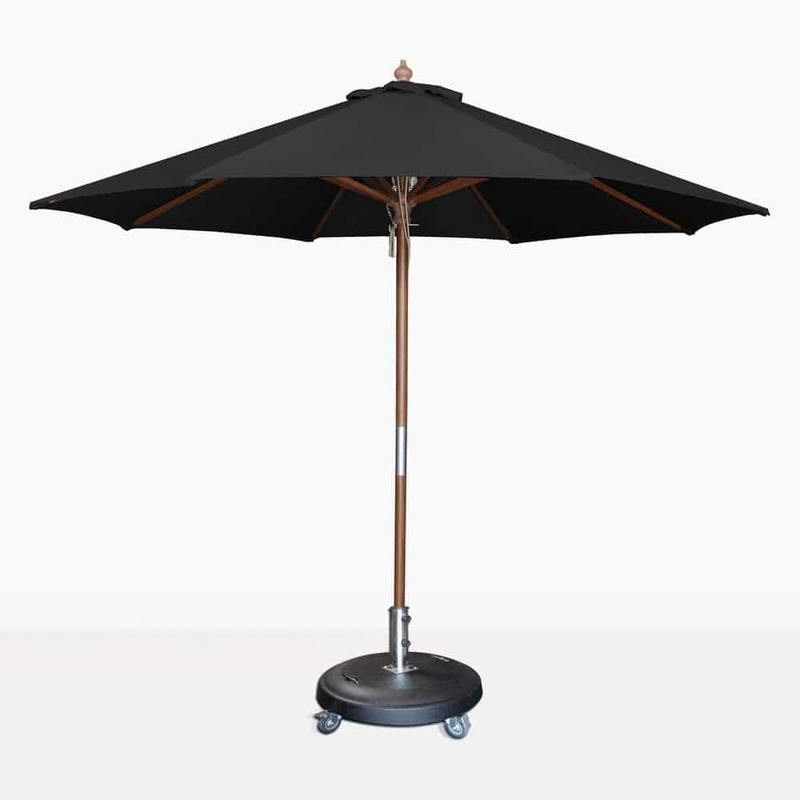 Chic and stylish; the Dixon Sunbrella Round Umbrella in Black from our classic umbrella range adds a sense of sophistication to your outdoor area. With a crisp, black canopy and a classic look; the Round Black Sunbrella from Dixon is the perfect choice for your patio, by the pool or in a commercial setting! These umbrellas are so popular because of their durability as well as their attractive, timeless design. Gone are the days when you have to replace your outdoor brolly every 6 months! 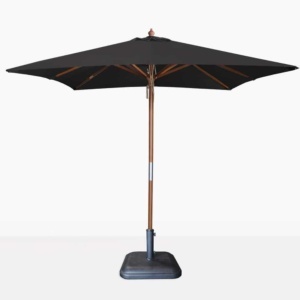 The Dixon Black Sunbrella will keep you in shaded glory for years! 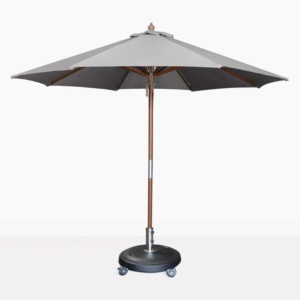 Purchase 8 to 10 of these gorgeous classic umbrellas in 2.5 metre size, and place each one in our Square Pedestal Table, complete with 4 Bruno Chairs in Black around each table for a sharp, swish and stylish setting for your café or restaurant! Our Dixon Round Black Sunbrella Umbrellas are a classic look, with a pulley system and a Sunbrella® canopy, meaning that this classic umbrella won't fade, discolor, and will remain strong for a long time to come! Design Warehouse is open 7 days a week, so you can feel free to call in, call up or email us with any questions about the Dixon Black Sunbrella or any of our other magnificent products. The umbrella base shown is not included in the price. Relax in blissful shade, knowing that you are being protected from the suns harsh rays with a 3 metre Dixon Round Black Sunbrella covering your two Tango Loungers in Black. Place a Concrete Letterbox in the middle of your loungers as a contemporary side table, perfect for your icy cold drinks! These superb umbrellas look wonderful on a patio sheltering your relaxing chairs or deep seating set. Try a Dixon Black Sunbrella Umbrella overtop of your Cabana Sofa and Loveseat with matching Black Sunbrella® cushions! Dress with a couple of white and black throw cushions for a splendid, art deco look you will adore hosting your friends and family in!